We preacher-types visit hospitals quite a lot. If we’re paying attention, they can be excellent places to practice paying close attention. All around you, every day at the hospital, the little dramas in this video are unfolding. When I’m visiting a hospital, I always try to keep that in mind, and I find that it adds immeasurably to the holiness of those moments. But the broader truth is that this dynamic is happening everywhere. Yes, hospitals are especially poignant in terms of the weighty life-stories that unfold there every day. But everywhere you go, these same kinds of little dramas are unfolding all around you. You could go, right now, to the park, mall, and movie theater near your house, and the same kind of video could be shot at each of those places too. For those who are practiced in seeing, the world is always teeming with stories. Buechner says if you do this enough, you begin to see the world as God sees it. You see God in the incredible beauty and diversity of God’s children. It can literally help you to develop your sense of compassion toward others. Not only are places like hospitals and parks good times to practice our seeing, but seasons are too. Christmas season definitely is. The metaphor of the Christmas story is God come to earth as a human being. The “Good tidings of great joy” are that God takes human form, born into a smelly, dirty stable in a tiny backwoods nation. The meaning of that metaphor seems to be that our human forms are not separate from God’s self, but a part of God’s good creation too…that incarnation happens all around us, all the time, if only we have eyes to see it. Christmas means that the phrase “God forsaken” is meaningless. There is no such place in God’s good earth. Because “God so loved the world” that God lived in the world too. The paradox of these two polarities are at the heart of the Christmas metaphor. “Is it too much to say that Stop, Look, and Listen is also the most basic lesson that the Judeo-Christian tradition teaches us? Listen to history is the cry of the ancient prophets of Israel. Listen to social injustice, says Amos; to head-in-the-sand religiosity, says Jeremiah; to international treacheries and power-plays, says Isaiah; because it is precisely through them that God speaks his word of judgment and command. That’s the way God sees God’s beautiful world. May God give us the grace to see and love our neighbors with “our imaginations as well as our eyes.” That’s the heart of incarnational seeing. It’s the way God calls us to see, not just during this holy season, but each and every day. touch him enough to change his views on the ACA. I doubt it. So I have read a fair amount of your blog posts. And I see lots of words, in one post you used the very churchy word of sanctification. But in all the words about reconciling, healing of UMC, keeping the UMC being relevant, I can’t find the path to sanctification. Are these not all the words that we seek more. How to better find the path to the foot of cross of Jesus? One of my friends once said he had to turn buddhism and a couple other religions to find a path with him integrating the Truths of Jesus to complete the path. Are the social agenda words diluting what people are truly needing in their lives? Who does not want to be the Shepherds in the field looking for a path. Yes! And they respond with “Let us Go and see” The did not create a council of voters, write a blog, make a mission statement. No they responded to the Holy Spirit and “Hurried off and found May and Joseph” Let everyone find the Christ child this season and follow Him to the foot of the cross. Interestingly, I am actually preaching about this topic this morning. Jesus not only offered salvation and sanctification through the cross, but also through his life and ministry too. His teaching, preaching, healing for the people he came into contact with was also a saving act. So, yes, the cross is important. But if it was ALL that was important, then why do we have the Gospels, the stories, the teachings at all? Surely they are not just window dressing, or precursing. No. Jesus was saving people through all all those encounters and stories and healings. 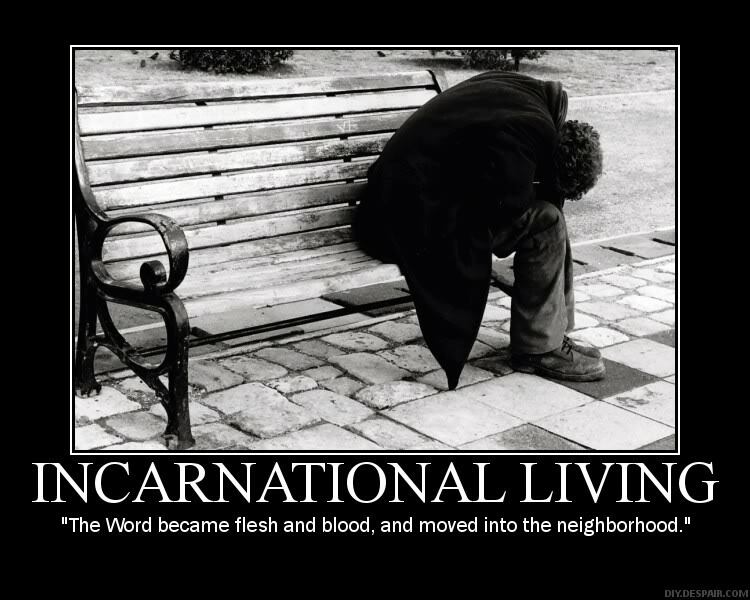 That means the incarnation of Christmas as important as the cross. One can’t happen without the other. There can be no “saving” of the world, unless God comes into the world and is present.